Often I get asked by people what supplements they should be consuming. My general opinion when it comes to supplementation is that it’s just that “supplementation”. I always advocate that the proper vitamins and minerals to ensure your system functions at its optimum can mainly be acquired from proper nutrition. There can be no substitute for real nutrient dense foods. If you are not eating correctly then your body doesn’t deserve supplements. It might sound harsh but I always put health first and there are no quick fixes. With that in mind what about those that actually do eat balanced healthy meals and exercise. One of the minerals that constantly comes to mind is magnesium. Magnesium of course exists in natural foods, pumpkin seeds, almonds, Brazil nuts, spinach rice, sesame seeds and the list goes on. Even though the magnesium found in these food sources are fairly high the volume and frequency with which they are eaten does not offer a fair supply to someone who is very active in particular an endurance athlete. An athlete following a LCHF (Low Carb High Fat) diet, such as myself consumes these types of foods in abundance but is it sufficient? The answer to that in my opinion is not. In all the curiosity surrounding magnesium I decided to run some blood tests. The two types of tests run are serum magnesium and red cell magnesium. In any persons case serum magnesium is critical for heart function, if it’s too low or too high you risk cardiac arrest, but this level is pretty much controlled at the expense of magnesium in the cells. Generally when a typical blood test is done it’s the serum magnesium levels that are measured and not the red cell magnesium. This is a problem as it doesn’t reflect the true status of where your magnesium levels need to sit. I insist on a red cell magnesium count, this is what you should be focused on. In my case even with an incredibly clean diet high in magnesium rich foods, my red cell magnesium count was truly on the very low end and I was actually not surprised. I noticed it specifically worsen during harder weeks when bouts of physical fatigue or tiredness set in. The solution of course was to supplement. I know you are going to ask me if I had a low magnesium count prior to supplementation and the truth is actually not. What I discovered is that my magnesium levels were not purely dependent on what I ate, but also the volume and intensity of exercise that I performed at. Quite simply, athletes need more nutrients than less-active people. We demand a lot more from our bodies than the average gym goer and there is a need to compensate with the right nutrients from foods first then supplement to ensure proper physical health, performance and recovery. Magnesium is a vital nutrient in many of the body’s chemical processes and is required in nearly every single cell in the body for proper function. Magnesium plays a crucial role when it comes to energy production. It is a major element required for the body to produce ATP (adenosine triphosphate) which is basically what fires the muscles and gets them to function. Low magnesium in the cells will ultimately lead to lowered ATP production which will equate into fatigue, cramping, reduced power and nausea. Some scientific studies on magnesium have found that endurance athletes that supplemented themselves with magnesium were able to perform at a maximal intensity for a longer period time and also had increased VO2 max. There is evidence that magnesium requirements are elevated in athletes, and that performance can benefit from higher intakes. Aside from being used up in the production of energy, magnesium can also assist performance by reducing accumulation of lactic acid and reducing the perception of fatigue during strenuous exercise through its action on the nervous system. Magnesium is also lost through sweat so an athlete training in a hot and humid environment will probably require more. Magnesium deficiency is quite common especially among the athlete population. This is mainly due to poor eating habits and also rigorous exercise where the magnesium demand is just not met. Magnesium is not produced by the body, it needs to be ingested daily through the consumption of magnesium rich foods and in an athlete’s case recommended supplementation. I began supplementing my diet with magnesium and after 2-3 weeks I began to notice an major difference in my energy levels, ability to perform and also better sleeping patterns at night (I monitor my sleep with Azumio Sleep Time ). There was a noticeable difference and I will even put myself out there to state it was a major difference in my performance ability. A re-test of bloods 8 weeks later showed my red cell magnesium levels had climbed and it directly correlated with how I felt. What magnesium supplements should you take? There are so many different magnesium supplements on the market and it’s good to question what you should be looking for when it comes to selecting a magnesium supplement. The most important thing to consider is the bioavailability and concentration of the product, in other words how much actual magnesium is there and of it how much will actually be absorbed and utilized by the system. Magnesium Citrate has been shown to have one of the highest levels of bioavailability, but a low concentrate of magnesium whereas magnesium oxide is highly concentrated but lower on the bioavailability end. Magnesium chloride lies in the middle of these two and it has moderate concentrations of magnesium but a fairly decent bioavailability. There are others but the ones that should be avoided are magnesium glutamate and magnesium aspartate they become neurotoxic due to lack of amino acid binding. Of course the preparation of the mineral will ultimately determine the outcome of impact and absorption. What is meant by preparation? Magnesium can of course come in its raw format often encapsulated of or coated such as an enteric coating which slows the breakdown of tablet to ensure it reaches the lower bowels where absorption is maximized. In truth this does help reduce the risk of stomach irritation by processing it lower down in a less acidic environment. Depending on the type of magnesium ingested and the magnesium status of the individual, these figures can be higher or lower. Studies have shown overall absorption of magnesium in some individuals as low as 20%. Aside from the delivery mechanism many magnesium supplements are bound with other minerals such as calcium or zinc. Some companies that manufacturer magnesium/calcium combination supplements promote a 2:1 or 3:1 ratio as being ideal for absorption of these elements. However, there is no credible research to support this claim. Now recently a new patented formula has been brought to market and this was something that completely caught my attention 2 years ago. A product that I used extensively in testing on myself and many athletes for a period of 18 months. What garnered my attention was the fact that the patent holder had completed extensive bio-availability testing which demonstrated a 100% absorption rate with the highly concentrated magnesium oxide and magnesium chloride which is known to be lower on the bio-availability side. With magnesium this is unheard of. Generally we athletes take multiple large doses to get the desired result. The second thing that I found highly attractive was the fact that this magnesium supplement had a consistent release time of 8 hours. Yes, you read correct, 8 hours. Meaning that consuming this would ensure I was getting a consistent and stable release of magnesium over a long period of time and this is what made it highly bioavailable. Then a third element popped into the picture which closed the deal. This magnesium compound was infused with L-Carnitine. This completely switched me on. L-Carnitine is critical to an endurance athlete. It transports long chain fatty acids into the mitochondria for ATP production and it also transports short chain fatty acids and metabolites out of the mitochondria. In simple terms it carries fat to the cells to be used for energy as well as slowing down lactic acid build up (it acts as a buffer). As a minimalistic fueller that predominantly relies on fat for fuel this was a shining light. I decided to put this to some ultimate testing. Not that I didn’t trust the doctor who invented the product, but as an athlete I needed to experience it for two main reasons. I am not prone to cramping and generally I blame muscle cramping on undertrained muscles in most athletes. In my case I wasn’t sure what parameters to set but decided to follow the dose directions and first off verify the impact on my sensitive digestive system. This passed with flying colors and even under high intensity sessions when consumed prior to exercise there was no negative digestive impact whatsoever. Then within a short period of time I began noticing two major benefits of this patented compound. DOMS (Delayed Onset of Muscle Stiffness) was reduced significantly so much so that I forgot I actually had compression garments ;-). In all seriousness after very hard sessions I had a major reduction in muscle stiffness. After 3 months of testing I decided to give this out to some elite athletes for further testing and the feedback was completely in line with what I was experiencing. Except for one thing which I could not account for was that one of my elite athletes in particular who had a severe cramping issue noticed a difference in that the onset of his cramps were delayed or even mitigated. Once I had completed thorough testing with many professional and amateur athletes there was no doubt that this patented compound had to be made available to the public. This is where 32Gi’s Trumag® came into being. I have tested many magnesium products over the years in many different variations and forms, but this is definitely a true slow release magnesium formula which has an incredible benefit for any endurance athlete. Another thing I found quite impressive is that for a person that cramps during sleep this becomes a simple solution due to its 8 hour release. It means that your magnesium requirements will be catered for throughout the night. Trumag is definitely a New Generation Magnesium supplement. In short magnesium supplementation is definitely high on my list of DO’s especially for an endurance athlete. There is more than enough evidence to support the benefits of magnesium supplementation. I plan on holding a webinar in the coming weeks with the Doctor who invented Trumag® as well as some of the athletes that have been testing it to provide some insight and feedback on the product. 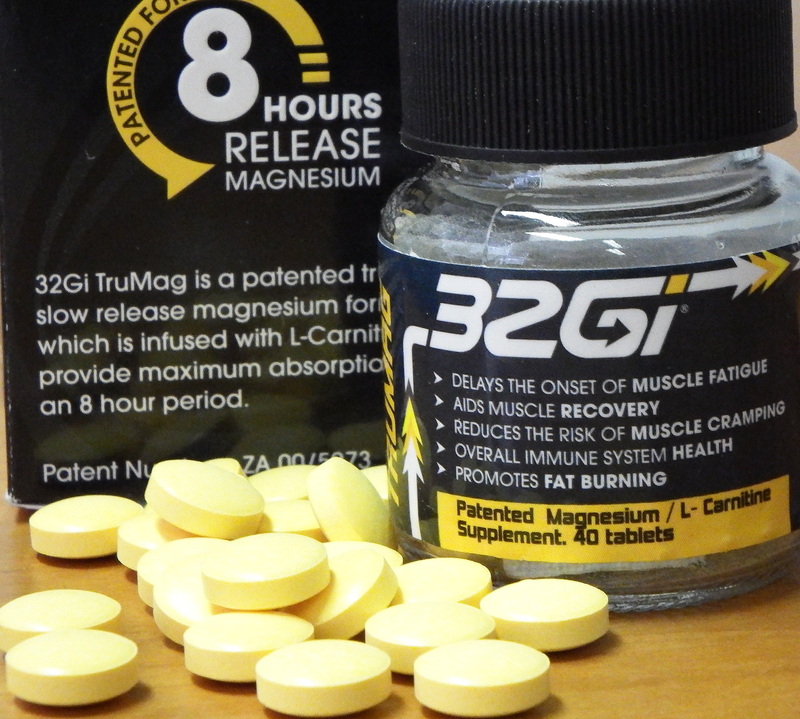 32Gi is proud to announce the launch* of patented TruMag™ a true slow release and 100% bioavailable magnesium tablet. Unlike most magnesium supplements on the market TruMag™ breaks down in the body of a period of 8 Hours and is completely absorbed by the system, making a single dosage extremely effective. The unique patented infused combination of Carnitine makes it a powerful formula for any endurance athlete due to Carnitines unique property of transporting free fatty acids to the mitochondria (muscle cells) to be utilized as a source of energy. Excellent. Exactly what i needed and have been looking. Will be off to Dischem tomorrow. Cheers !!! Very glad to read about this and it is exactly what we need for our Epic training too. This is great, thank you. I am definitely going to try this product out. I have been taking Slowmag for years which has worked well but am always keen to try something new. I just wanted to know, will the L-Carnitine aspect of it only be beneficial if you are on a LCHF eating plan or would it also be beneficial to us few high-carb eaters out there? Great thanks! Good to know.